We believe there are two types of leaders in every organization, title and authentic leaders. Title leaders are those who rely solely on power, title and authority to influence employees. This leadership philosophy may obtain short-term results, but it is limited since employees will become fearful and develop “paycheck mentalities.” Authentic leaders rely on building trust, coaching, and identifying the unique motivators for each employee. If people follow managers and supervisors because they have to, they are title leaders, if people follow managers and supervisors because they want to, they are authentic leaders. Our training concepts and ideas revolve around developing and enhancing “authentic leadership” skills. James Bird Guess Success Academy developed our methodology of “adaptable leadership,” – the ability to change and adjust to meet changing circumstances or as James wrote in his bestselling book, Lead Like Water. There are five phases to help engage, equip and empower leaders to lead effectively. The initial phase includes assessment (Assess) of current leadership skills/competencies compared to the immediate and future needs of the organization and identifying the leadership gap. After digesting (Digest) collected data, we work with the organization to customize and design (Design) a curriculum to close the leadership gap. Successful execution (Execute) and implementation includes engaging attendees with training content that is practical and insightful and providing post-training tools to ensure skills transfer back in the workplace. Because we do not deliver outdated off-the-shelf training, we can easily adapt (Adjust) to the organization’s needs and requests at any time and make adjustments to unforeseen needs and challenges. An extensive assessment process utilizing surveys, qualitative data collection techniques, and facilitated processes with internal leaders, staff and key stakeholders ensures that we develop an in-depth understanding of the current situation. A series of meaningful conversations will sharpen our focus and provide clarity and alignment around potential threats, and opportunities as well as shed light on the strategic direction and the necessary behaviors to effectively position the organization to achieve ongoing success. A simplistic one page strategic plan is developed to ensure successful execution while obtaining buy-in, momentum, and sustainability. A variety of practical tools and ideas are customized based on the organization’s strengths and existing culture.The one page plans are designed to drive immediate action that cascades from the organization to departments and finally individual staff. Plans are not perfect. Customized training and coaching at every level equips managers and staff with the specific skill-set to be flexible, adaptable and anticipate to adjust in real time. Alignment with the strategic plan from the bottom up ensures decision-making is consistent, effective and produces positive results. Periodic reassessments of organizational culture, leadership, and team alignment provide additional opportunities to adjust quicker to achieve desired results in a fast changing work environment. 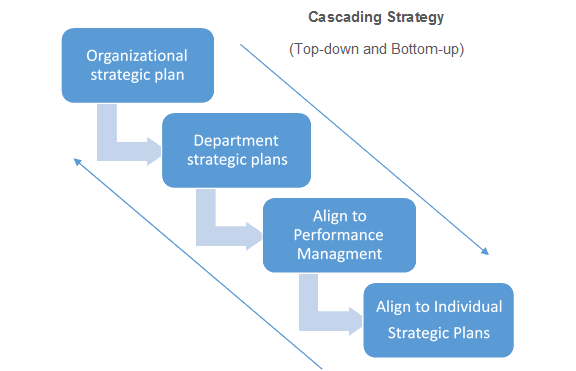 Cascading is the process of aligning and communicating strategy throughout the entire organization. 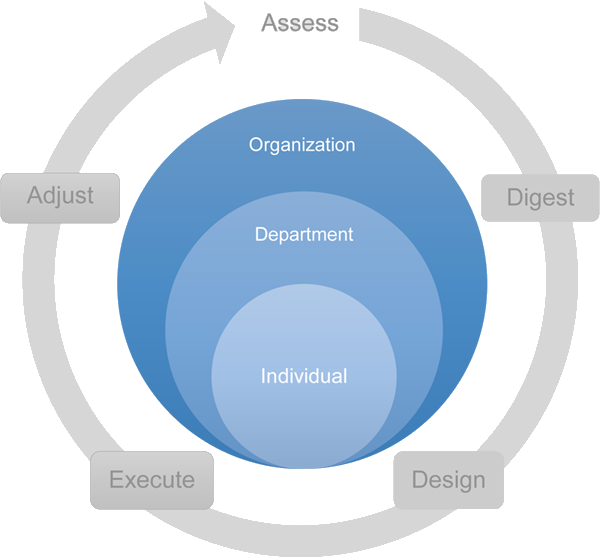 It connects organizational level goals to the department or functional goals, and ultimately to the individual. It is both a top-down and a bottom-up flow of information which aligns the work at every level with the overall strategy of the organization. Cascading effectively equips staff at every level to have a strategic mindset and make decisions that support the overall strategy. It also delivers a clear direction to for departments to create and align their strategic plans and scorecards to the organizational level strategy. The adaptable leadership model forms the basis for successful strategic planning and execution. It brings transparency and accountability to the core values and objectives of the organization, and ensures tactics and all workplace activities are aligned to the strategic priorities. The concise one-page format minimizes confusion and provides fast, flexible and adaptable actions.